The past two weeks have flown by for us. Stu was off for the first week and my mum has been off the past two weeks (my sister is always off, except for a couple of shifts she’s been doing at the local hospital to earn some money during her break from uni), so we have had a very busy couple of weeks, having days out and a mini trip away. I think Oliver and I are going to miss everyone this week, my sister is on holiday in Ireland with her boyfriends family, and mum and Stu are both at work. 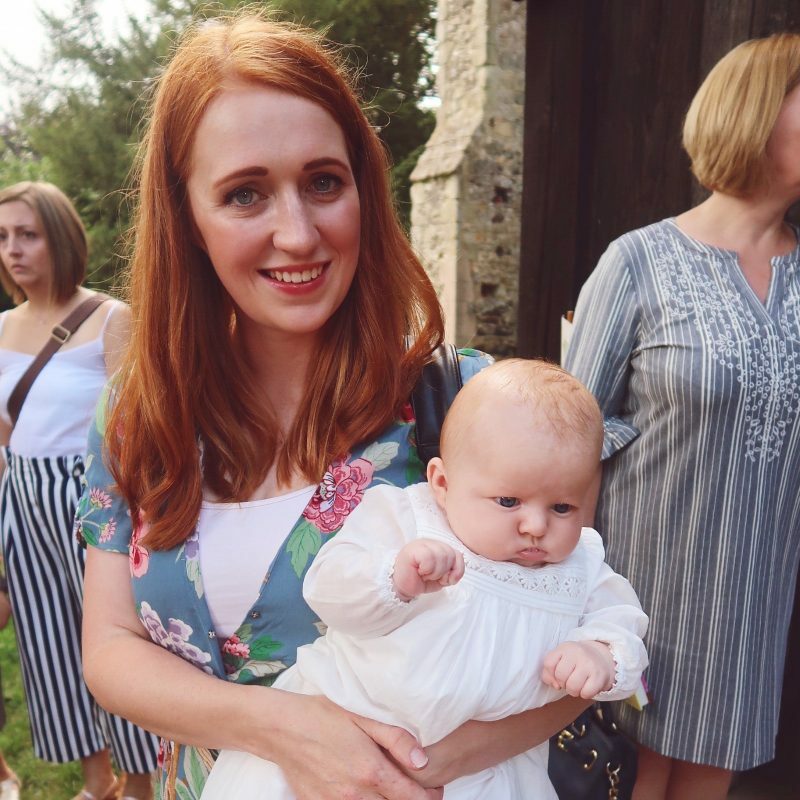 I forget how horrible it is going back after a break from work, although when I go back after my maternity leave it will be even more difficult! At least I have another 7 months. Our first week was primarily focused on a trip up north, well to the Midlands, but that’s pretty north from leafy Surrey! 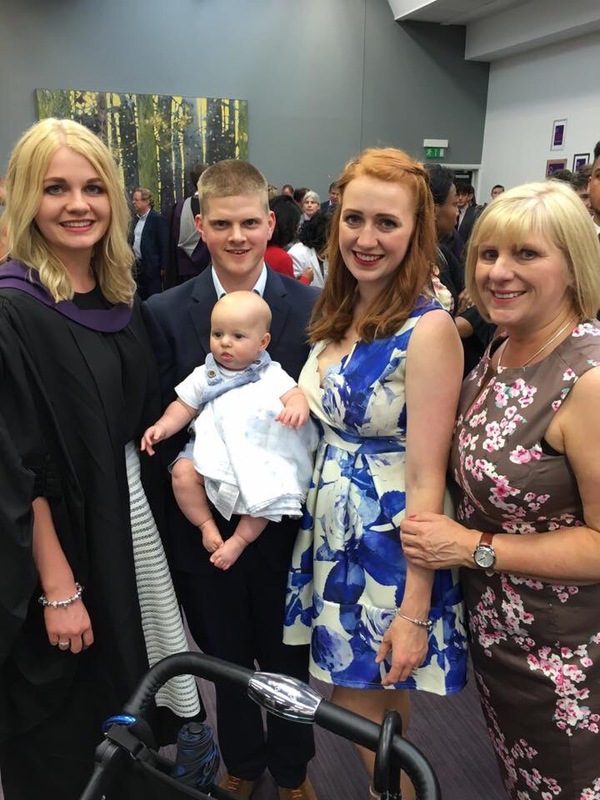 My sister was graduating from Loughborough University (with a first in medicinal and pharmaceutical chemistry), so we travelled up as a family for that. 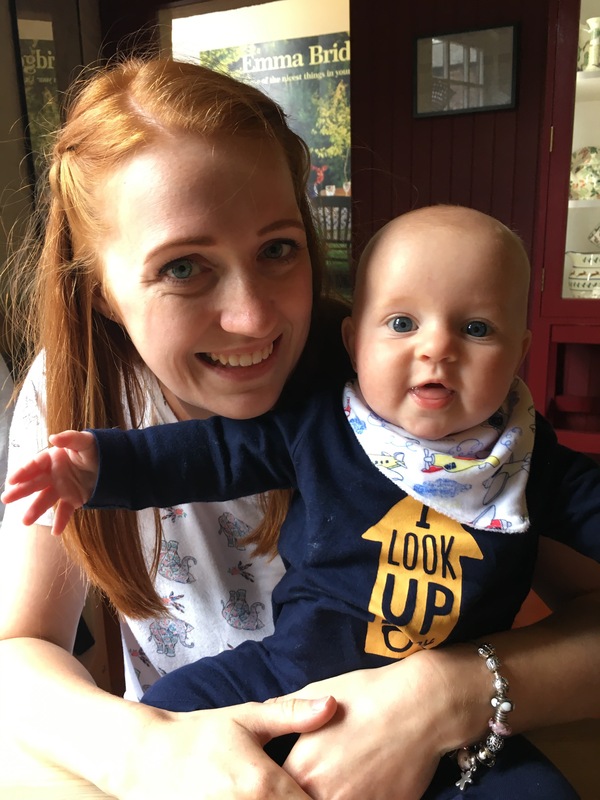 It was our first long car journey with Oliver, he behaved really well, he slept most of the journey, we made one stop for a feed, but other than that he was good as gold! The ceremony was lovely, Oliver decided to cause a bit of a fuss at the start, Stu took him out for a bit to try and get him to sleep, he was having none of it and came back in just in time to see my sister receiving her degree. He fell asleep pretty much straight after she got it, so we are sure he was protesting just so he could see her! After the graduation, we made our way over to Stoke-on-Trent for our first family night away. We had big plans to visit the Emma Bridgewater factory the next day. I’m a big collector of Emma Bridgewater, as are my mum and sister, so I had been dying to go there for ages. Having Oliver was the perfect excuse, as they put baby footprints on a plate for you, and as a big fan, this was a must for me! 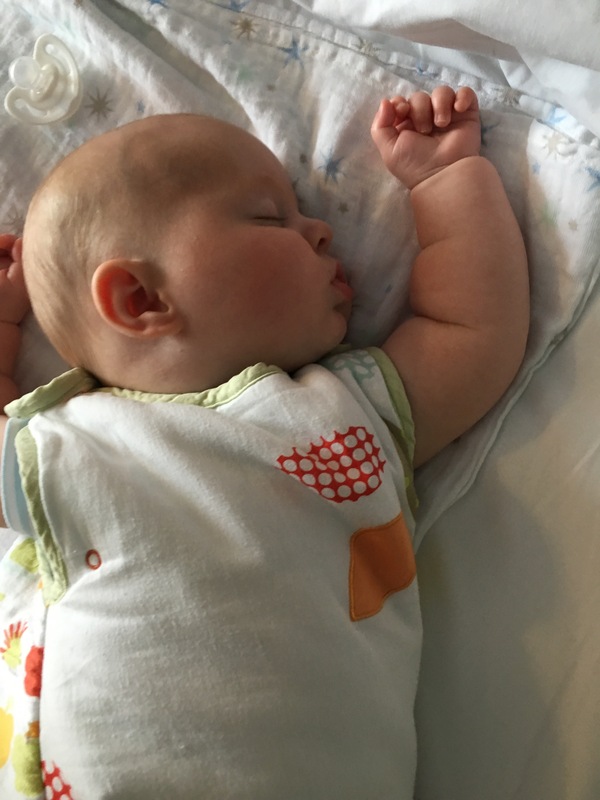 This was our first night using the travel cot, when I had previously been away for the night I had dismantled his crib and taken that, to help him sleep, but now he’s in his cot it isn’t that easy! I tried to make it extra cosy with an extra blanket underneath as the base was pretty hard. Oliver went to sleep on our bed as usual, I popped him in the travel cot and we went to sleep. He woke every two hours, which is most unlike him, so after a couple of wake ups I decided to keep him in our bed to see if this would help. Of course he slept like a dream! He loves snuggling up, so we had a nice snuggle and he slept for about 4 hours straight! Fast asleep on our bed at the hotel! We had a great time at the factory, going on the factory tour was so interesting and it’s great to see how each piece is made and decorated by hand. We had lunch there, which was divine, did a bit of shopping and had a look around the walled gardens. They had chickens there which Oliver was fascinated by! We headed over to the decorating studio and got Oliver’s prints put on a plate and mum, my sister and I did a little bit of decorating some pottery ourselves. We headed back on the 3.5 hour journey home, Oliver was great and we only had to make one stop to feed him. 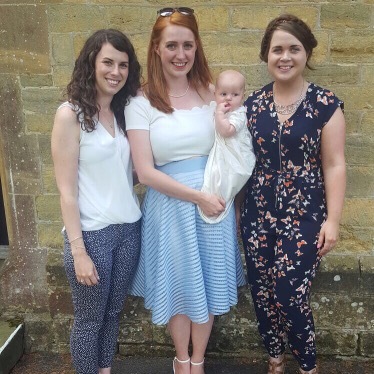 The rest of the week was mainly focused on the run up to Oliver’s christening. We had it at the local church and invited a large group of our good friends and family. After the christening we had a party in the garden, it was a really lovely afternoon, we had lots of sandwiches,cake and biscuits and the weather was beautiful. 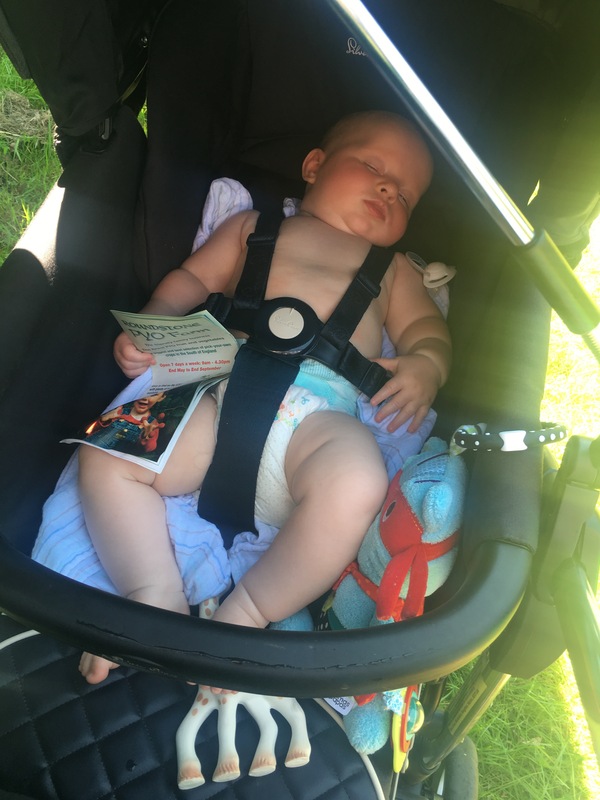 Oliver was on the most part well behaved, he is a very poor napper at the best of times, and at events where there are more than just our family, he always opts to stay awake, no matter how hard we try to get him to sleep! I managed to get him to go to sleep eventually, but he really resisted! 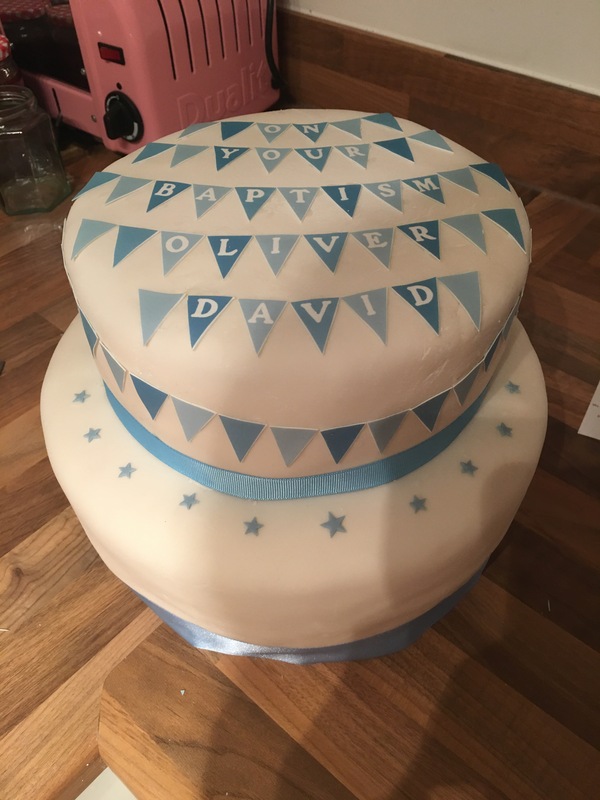 Oliver’s christening cake I made from scratch! The second week we had the heatwave, which I already posted about. 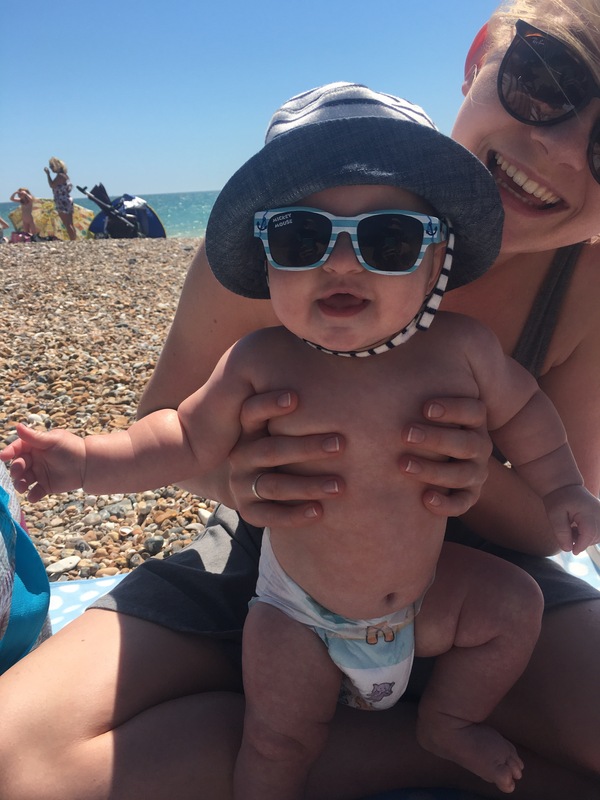 We made Oliver’s first trip to the beach at Goring, he loved it, we didn’t actually go in the water as there was loads of seaweed and it was probably a bit cold for him anyway. We had a lovely walk along the seafront and then made our way to the pick your own at Roundstone Farm in Worthing, my mum and sister did all the picking, as it was just too hot for Oliver and I so we sat in the shade and watched them. It’s a really great pick your own, they have just about anything you could want! Our guide fell asleep on the job! The rest of the week we spent mostly in the garden. 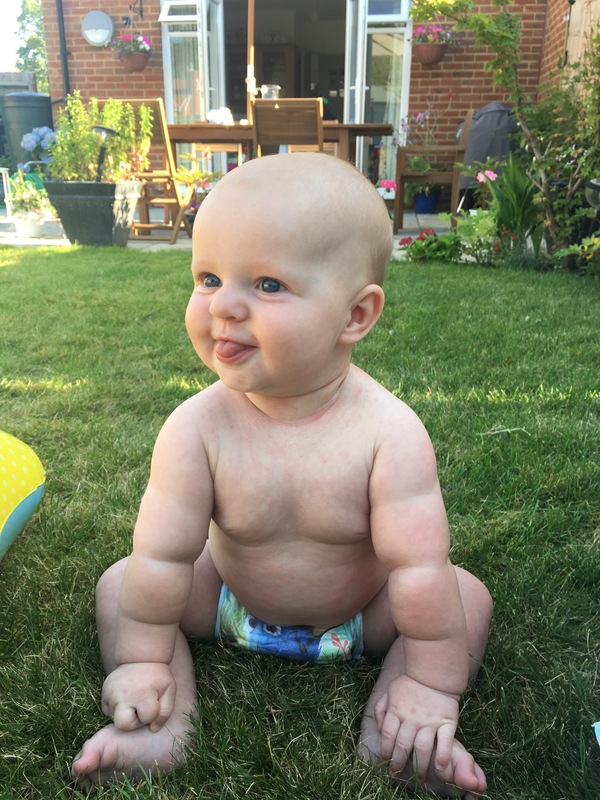 Oliver tested out his paddling pool and he really enjoyed it, he loves splashing his hands in the water and he because the base is slippery he can rotate around at his own pleasure! 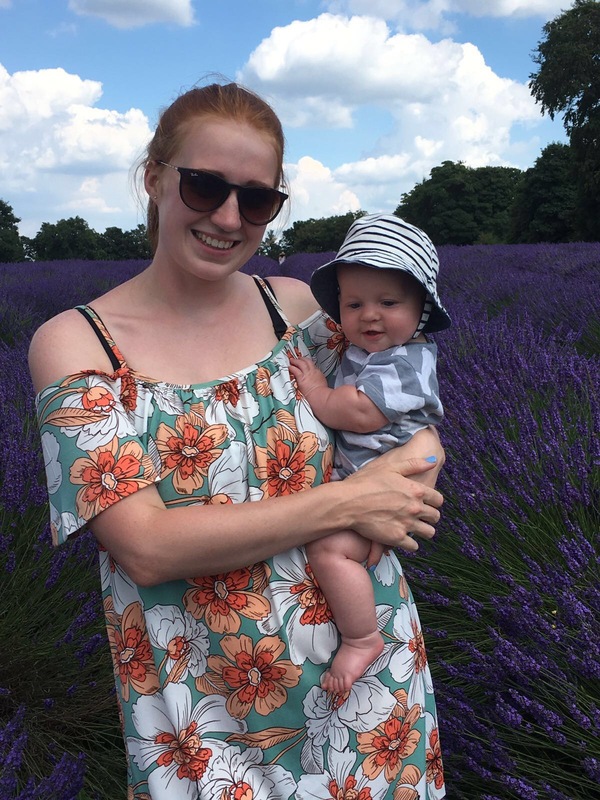 We saw a friend and her son on Thursday, hes almost 2 and Oliver loved watching him running around the garden, it will be cute to see what they will be like together next summer! Friday was spent visiting my aunt and cousins with mum. We had a lovely afternoon and Oliver got lots of great auntie cuddles and cuddles with my cousins. He’s the first baby on my side of the family and the first boy in a generation, as all my cousins are girls,so he’s pretty special! 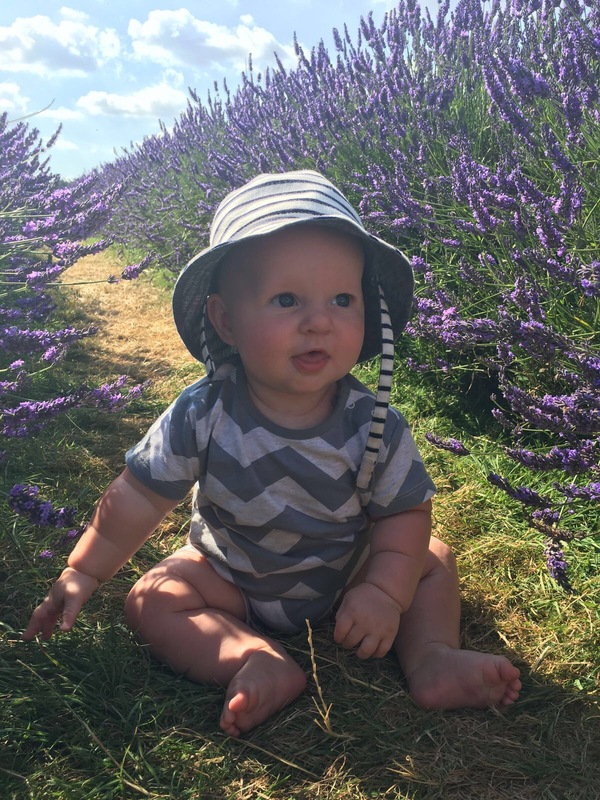 On Saturday Stuart was working, so mum and I decided we would go and visit the lavender fields at Mayfield lavender. We had never been before, even though it’s only a 45 minute trip, but we will definitely be going again! It was absolutely stunning. It was lovely to walk through, and Oliver loved reaching out and grabbing the plants. We bought some fresh lavender in their shop and stopped to have some lavender ice cream, which was delicious. Oliver even tried a tiny bit on my spoon and I’m sure if he could, he would have given it a thumbs up! They sold just about anything lavender, lavender biscuits, tea, cake, jam, and a lot of different smelly products. 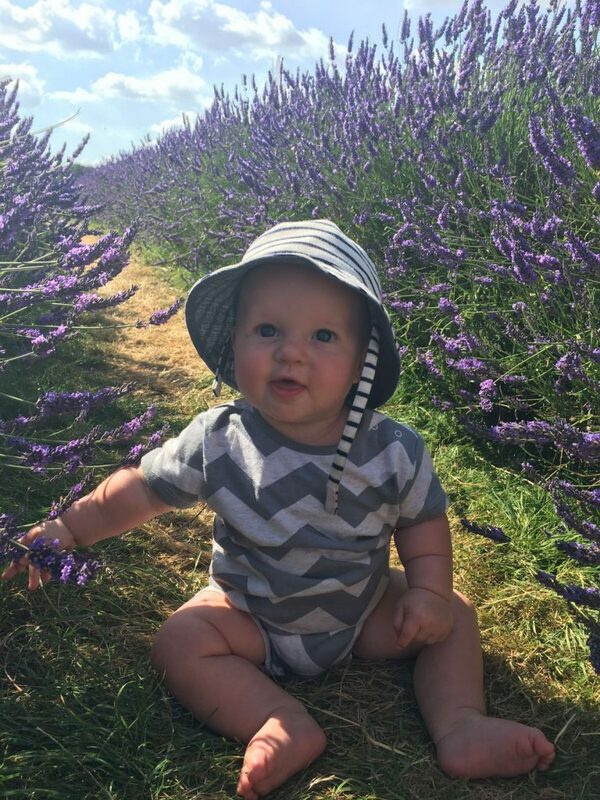 I think lavender is a great sensory plant for babies, it smells so good and they can feel it too, Oliver definitely enjoys playing with it! ​This week should be a nice quiet one, we haven’t got many plans, so I can try and catch up on some housework and the growing ironing pile! The weather is meant to be cooler as well so I have no excuses to not do anything! Previous Post Summer’s finally here!